Motorola Mobility, India has expanded its smartphone portfolio with the launch of Motorola Flipout, an Android 2.1 OS based phone in India. As per the date of announcement, the phone has landed in major retail mobile stores in India at a price of Rs. 15,990. Based on new Android 2.1 OS, Motorola smartphone “Flipout” is a cool choice for people who are young at heart and desire smart and advanced features in their handset. 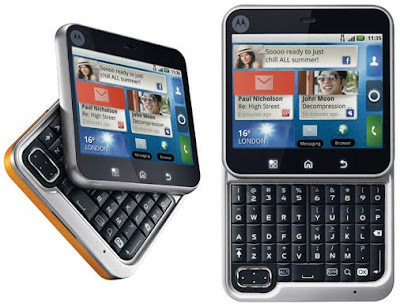 It’s Motoblur and QWERTY keypad features will handle User Interface of this handset to let it work smoothly. 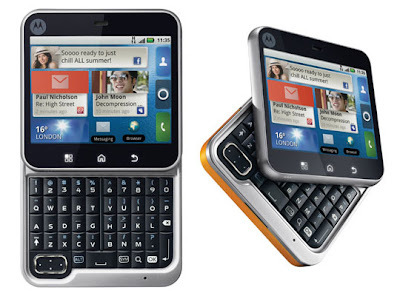 It is a QWERTY phone which slides out, which is why it called as Flipout. Android OS was originally developed by Google and later it became an Open Handset Alliance (OHA). It is a consortium of 50 software, hardware and telecom companies. Therefore, now the developers can design various unique applications which may be downloaded on any mobile handset. Over 70,000 applications covering games, music, and location-based services may be used. Android based Motorola Flipout will truly light this festive season. Coming on to the specifications of Motorola's Flipout, its most highlighted features revealed are its 2.8 inch wide display with 320X420 pixels resolution, HSDPA 900 / 2100 MHz network based 3G capabilities, 3.1 megapixel camera, expandable memory to upto 32GB, Wi Fi, and access to Google services. It runs on 700 MHz processor and has multi-touch screen. Its homescreen features customizable widget support and almost all the social networking sites can be accesed right there. One may upload clicked pictures and made videos instantly on sites such as Facebook, MySpace, Picasa and Photobucket using Flipout. The internal memory storage of Motorola Flipout stands at 512MB ROM / 256MB RAM. Phone supports A-GPS and e-compass for easy navigation. For music lovers, there is a 3.5mm headset jack, FM Radio and for connectivity, there is USB 2.0 HS and Wi-Fi. Messaging features of Flipout are MMS, SMS, Email in protocols as Corporate Sync, POP3, IMAP, Push Email and IM. The physical dimensions of Motorola Flipout are 67.00 x 67.00 x 17.00 mm and it weighs 120 grams. Motorola Flipout is launched in vibrant colours such as White, Licorice, Saffron, Poppy Red, Fairway Green, Brilliant Blue and Raspberry Crush colors. I think at this price this a gift for the mobile lovers. This Motorola has got all the features which you can think for. This is definitely going to hit the Indian market.